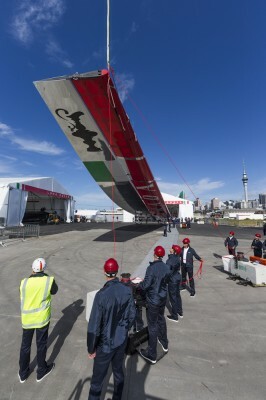 Auckland (New Zealand), October 26th 2012 – The AC 72 Luna Rossa catamaran,challenging in the 34th America’s Cup, was launched today in Auckland, New Zealand. 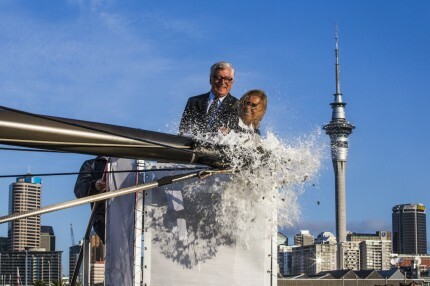 At 6,40 pm local time, Miuccia Prada, with her husband Patrizio Bertelli at her side – the Team Principal of Luna Rossa Challenge 2013 – broke the champagne bottle, thus christening the 22-metre maxi catamaran: mirrored hulls and a 40-metre high wingsail, its aft half also mirrored. 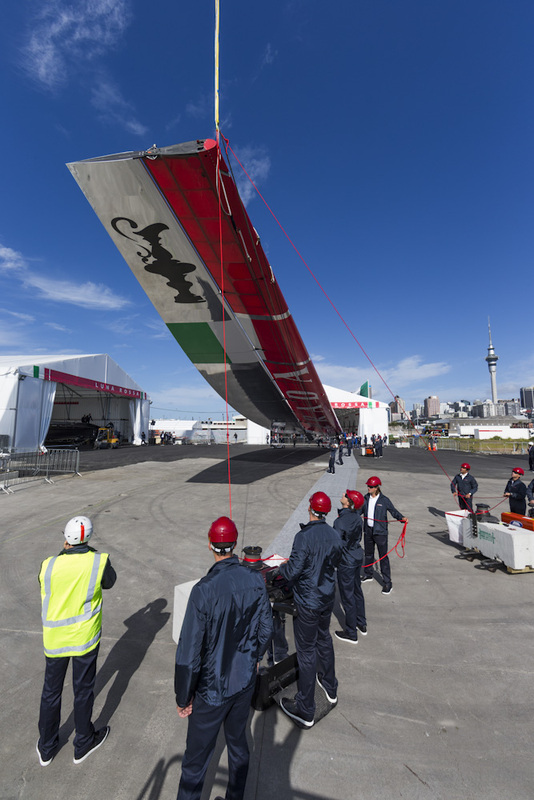 Luna Rossa’s AC 72 is the outcome of the effort that has kept the 70 team members busy for nearly one year; during this time, research, experimentation and construction progressed in lockstep, with use of the most sophisticated and breakthrough technology. Construction involved 300 people for a grand total of 52,000 working hours – 12,000 to build the wingsail, 17,000 for hulls construction, and 23,000 to build the platform and foils. 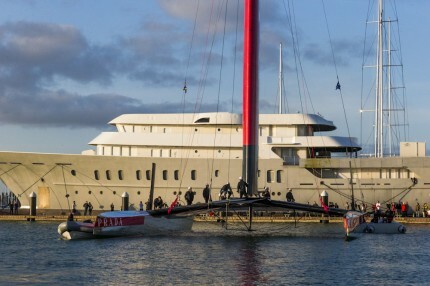 500 kg of titanium were used, and there are about 2,000 metres of ropes on board (halyards, sheets, etc.). The launch was followed by a lively party for all the team’s families; 350 guests were present, including the President of Circolo della Vela Sicilia (i.e. the challenging yacht club) Agostino Randazzo, Grant Dalton (CEO of ETNZ Emirates Team New Zealand), Steve Burrett (Commodore of the Royal New Zealand Yacht Squadron), the Ambassador of Italy in New Zealand Alessandro Levi-Sandri, Sir Michael Fay, and the Maori community representative Alec Hawke of Ngāti Whātua o Orākei. The launching ceremony will be broadcast shortly on www.lunarossachallenge2013.com. 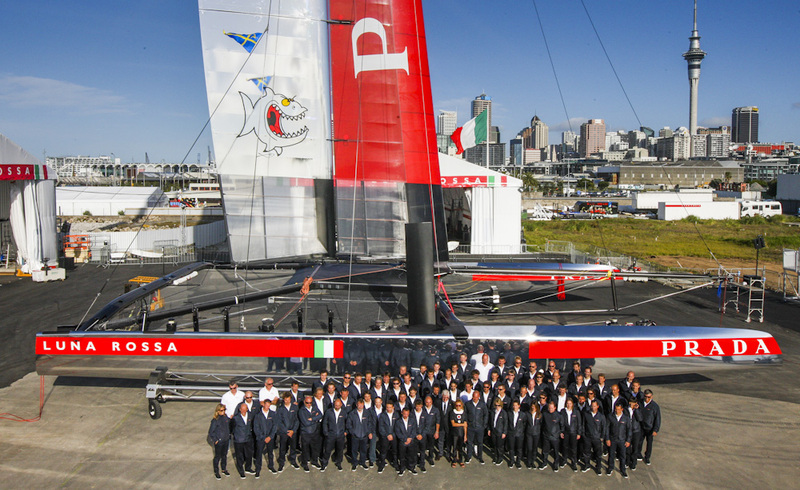 The team Luna Rossa was established in 1997 by Patrizio Bertelli with the original name of “Prada Challenge for the America’s Cup 2000”. At its first attempt the team wins the Louis Vuitton Cup – the challengers’ selection series – in 2000, with a record of 38 victories over 49 races. 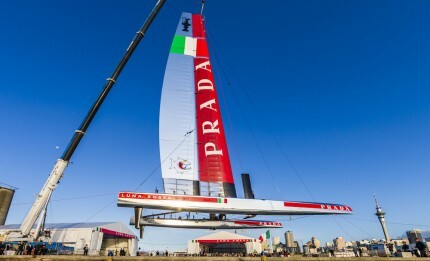 Luna Rossa has participated also in 2003 and in 2007 it reached the Louis Vuitton Cup final. 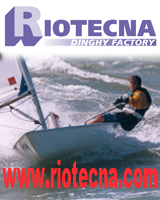 In 2011, the team won the Extreme Sailing Series, the Extreme 40’ catamarans circuit. 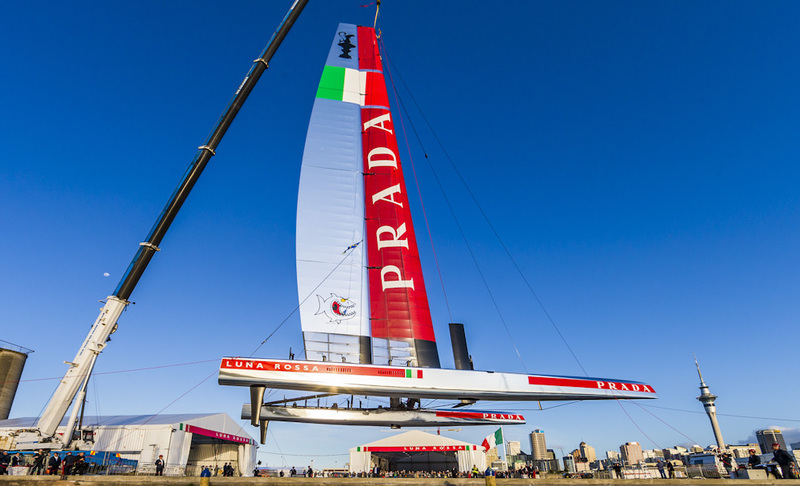 In 2012, it raced in the America’s Cup World Series with two AC45 catamarans (Luna Rossa Piranha and Luna Rossa Swordfish), winning the fleet races in the Naples and Newport events, and proving to be extremely competitive. 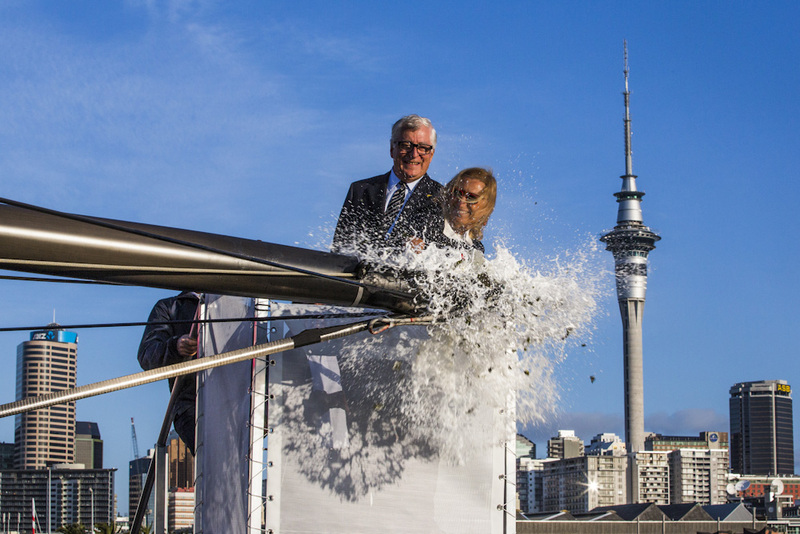 In June 2012 Patrizio Bertelli was the first Italian to have been inducted into the America’s Cup Hall of Fame. Juanpa a ver si consigues fotos de detalle en HD de los ac72! estaria de lujo la verdad! xq fue botado en auckland cuando debio haber sido construido en italia? Los cascos fueron laminados en Italia, el resto fue hecho en NZ. Artemis lamino los cascos en Suecia y el resto fue hecho en Valencia. El reglamento dice que los cascos deben ser hechos en el pais al que representan. el barco es una tormenta de facha!!! QUIERO VER LA BESTIA ROJA DE JUAN K!!!! Le pongo todas las fichas! Terry ya esta comprando protector Nro 150. Siempre odié los paragolpes traseros de los Falcon porque me autoencandilaba. …el secreto está en iker y Xabirote…Aupa Larri Larri!!!! Muy bonito, la verdad. Ahra después de la sesión de fotos que lo embalen y guarden estas locuras en algún museo. 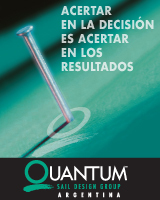 Coincido…. Especialmente en lo de “locuras” ¿serán conscientes de que alguno se va a matar con estos bichos del averno? Viendo el barco cromado, solo puedo pensar en el laburo infernal que debe ser para mantenerlo limpio ¡Las vetas que se le deben hacer! cuantos deportes evolucionan asi? creo que es el unico. tuve que mirar dos veces: pense que era una central termica. que tiene de lindo esto?